The domain within your query sequence starts at position 208 and ends at position 260; the E-value for the LIM domain shown below is 5.87e-12. 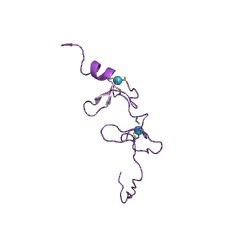 Zinc-binding domain present in Lin-11, Isl-1, Mec-3. Zinc-binding domain family. Some LIM domains bind protein partners via tyrosine-containing motifs. LIM domains are found in many key regulators of developmental pathways. Caenorhabditis elegans mec-3; a protein required for the differentiation of the set of six touch receptor neurons in this nematode. C. elegans. 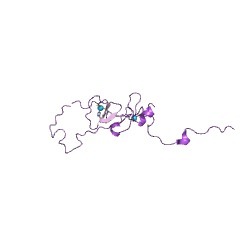 lin-11; a protein required for the asymmetric division of vulval blast cells. 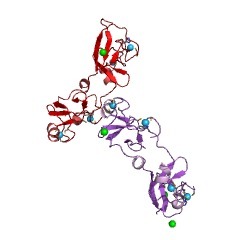 Vertebrate insulin gene enhancer binding protein isl-1. 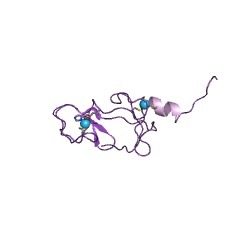 Isl-1 binds to one of the two cis-acting protein-binding domains of the insulin gene. 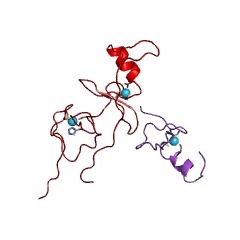 Vertebrate homeobox proteins lim-1, lim-2 (lim-5) and lim3. 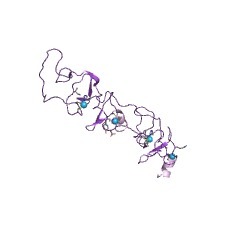 Vertebrate lmx-1, which acts as a transcriptional activator by binding to the FLAT element; a beta-cell-specific transcriptional enhancer found in the insulin gene. Mammalian LH-2, a transcriptional regulatory protein involved in the control of cell differentiation in developing lymphoid and neural cell types. Drosophila melanogaster (Fruit fly) protein apterous, required for the normal development of the wing and halter imaginal discs. 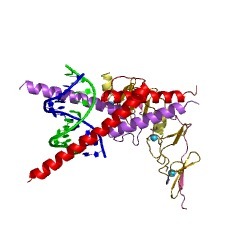 Vertebrate protein kinases LIMK-1 and LIMK-2. Mammalian rhombotins. Rhombotin 1 (RBTN1 or TTG-1) and rhombotin-2 (RBTN2 or TTG-2) are proteins of about 160 amino acids whose genes are disrupted by chromosomal translocations in T-cell leukemia. 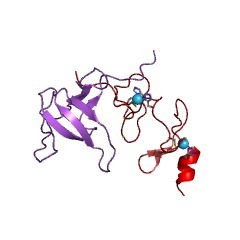 Mammalian and avian cysteine-rich protein (CRP), a 192 amino-acid protein of unknown function. Seems to interact with zyxin. 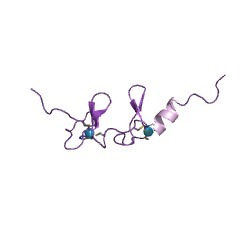 Mammalian cysteine-rich intestinal protein (CRIP), a small protein which seems to have a role in zinc absorption and may function as an intracellular zinc transport protein. Vertebrate paxillin, a cytoskeletal focal adhesion protein. Mus musculus (Mouse) testin which should not be confused with rat testin which is a thiol protease homologue (see IPR000169). Helianthus annuus (Common sunflower) pollen specific protein SF3. Chicken zyxin. 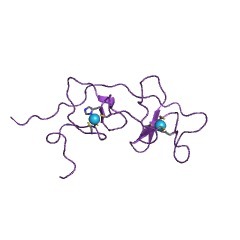 Zyxin is a low-abundance adhesion plaque protein which has been shown to interact with CRP. Yeast protein LRG1 which is involved in sporulation [(PUBMED:8065929)]. Saccharomyces cerevisiae (Baker's yeast) rho-type GTPase activating protein RGA1/DBM1. 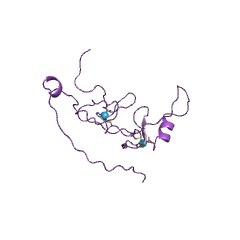 C. elegans homeobox protein ceh-14. 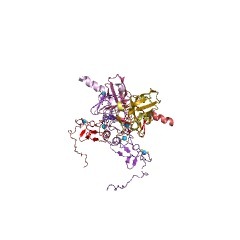 C. elegans homeobox protein unc-97. 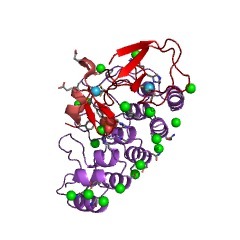 S. cerevisiae hypothetical protein YKR090w. 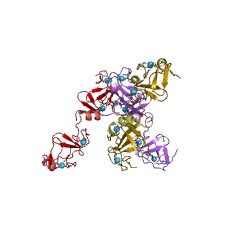 C. elegans hypothetical proteins C28H8.6. 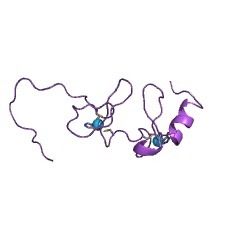 These proteins generally contain two tandem copies of the LIM domain in their N-terminal section. Zyxin and paxillin are exceptions in that they contain respectively three and four LIM domains at their C-terminal extremity. In apterous, isl-1, LH-2, lin-11, lim-1 to lim-3, lmx-1 and ceh-14 and mec-3 there is a homeobox domain some 50 to 95 amino acids after the LIM domains. LIM domains bind two zinc ions [(PUBMED:8506279)]. LIM does not bind DNA, rather it seems to act as an interface for protein-protein interaction. 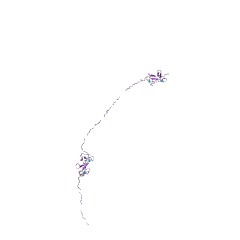 There are 113896 LIM domains in 51102 proteins in SMART's nrdb database. Taxonomic distribution of proteins containing LIM domain. This tree includes only several representative species. The complete taxonomic breakdown of all proteins with LIM domain is also avaliable. Click on the protein counts, or double click on taxonomic names to display all proteins containing LIM domain in the selected taxonomic class. Fold prediction and evolutionary analysis of the POZ domain: structural and evolutionary relationship with the potassium channel tetramerization domain. Using iterative database searches, a statistically significant sequence similarity was detected between the POZ (poxvirus and zinc finger) domains found in a variety of proteins involved in animal transcription regulation, cytoskeleton organization, and development, and the tetramerization domain of animal potassium channels. Using the crystal structure of the Aplysia Shaker channel tetramerization domain as a template, the common structure of the POZ domain class was predicted. 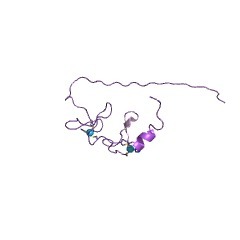 Examination of the structure resulted in the identification of several structural features and specific amino acid residues that may be involved in conserved protein-protein interactions mediated by the POZ domains as well as those that may contribute to the specificity of these interactions. Phylogenetic analysis of the POZ domains suggests that the common ancestor of the crown group eukaryotes already possessed this domain; POZ domains have undergone independent expansion in plants and in different animal lineages. 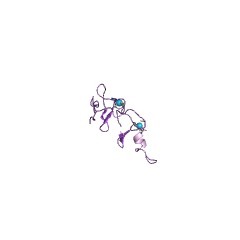 RING fingers and B-boxes: zinc-binding protein-protein interaction domains. 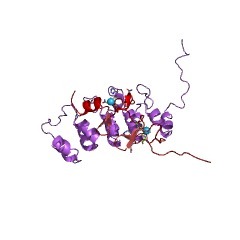 The cysteine-rich zinc-binding motifs known as the RING and B-box are found in several unrelated proteins. 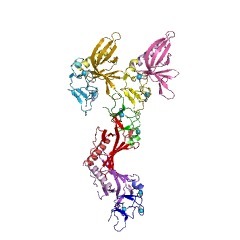 Structural, biochemical, and biological studies of these motifs reveal that they mediate protein-protein interactions. Several RING-containing proteins are oncoproteins and recent data indicate that proapoptotic activities can be mediated through the RING. 1H NMR methods were used to determine the structures of RINGs and a B-box domain and to monitor the conformational changes these motifs undergo upon zinc ligation. This review discusses in detail the structural features of the RING and B-box domains. Further, possible structure function relationships for these motifs particularly in their role as protein interaction domains are discussed. 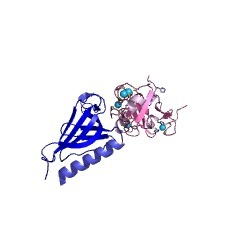 Interactions between LIM domains and the LIM domain-binding protein Ldb1. LIM domains mediate protein-protein interactions and, within LIM-homeodomain proteins, act as negative regulators of the transcriptional activation function of the protein. The recently described protein Ldb1 (also known as NLI; LIM domain-binding protein) binds LIM domains in vitro and synergizes with the LIM-homeodomain protein Xlim-1 in frog embryo microinjection experiments. In this study we localized the transcriptional activation domain of Xlim-1 to its carboxyl-terminal region, and characterized the interactions of the amino-terminally located LIM domains with Ldb1. Ldb1 binds LIM domains through its carboxyl-terminal region, and can form homodimers via its amino-terminal region. Optimal binding to Ldb1 required tandem LIM domains, while single domains could bind at lower but clearly measurable efficiency. In animal explant experiments, synergism of Ldb1 with Xlim-1 in the activation of downstream genes required both the region containing the dimerization domain of Ldb1 and the region containing the LIM-binding domain. The role of Ldb1 may be to recruit other transcriptional activators depending on the promoter context and LIM-homeodomain partner involved. The nuclear LIM domain interactor NLI mediates homo- and heterodimerization of LIM domain transcription factors. LIM domain-containing transcription factors are required for embryonic survival and for the determination of many cell types. The combinatorial expression of the LIM homeodomain proteins Isl1, Isl2, Lhx1, and Lhx3 in subsets of developing motor neurons correlates with the future organization of these neurons into motor columns with distinct innervation targets, implying a functional role for LIM homeodomain protein combinations in the specification of neuronal identity. 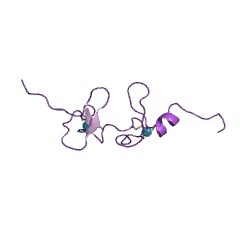 NLI is a widely expressed, dimeric protein that has been shown to specifically interact with the LIM domains of LIM domain-containing transcription factors. The present studies demonstrate that NLI mediates homo- and heteromeric complex formation between LIM domain transcription factors, requiring both the N-terminal dimerization and C-terminal LIM interaction domains of NLI. Although the interaction between most LIM homeodomain proteins is dependent on NLI, a direct interaction between the LIM domains of Lhx3 and the homeodomains of Isl1 and Isl2 was also observed. 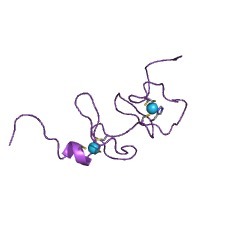 This interaction was disrupted by NLI, demonstrating that the conformational state of Lhx3-Isl1/Isl2 complexes is modified by NLI. Evidence indicating that NLI facilitates long range enhancer-promoter interactions suggests that NLI-dependent LIM domain transcription factor complexes are involved in communication between transcriptional control elements. 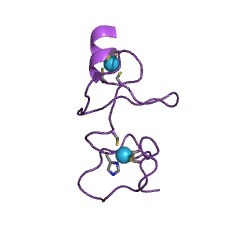 Solution structure of the carboxyl-terminal LIM domain from quail cysteine-rich protein CRP2. Proteins of the cysteine-rich protein (CRP) family (CRP1, CRP2, and CRP3) are implicated in diverse processes linked to cellular differentiation and growth control. 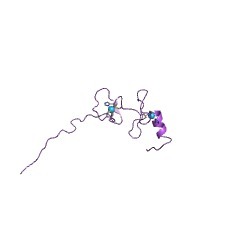 CRP proteins contain two LIM domains, each formed by two zinc-binding modules of the CCHC and CCCC type, respectively. The solution structure of the carboxyl-terminal LIM domain (LIM2) from recombinant quail CRP2 was determined by multidimensional homo- and heteronuclear magnetic resonance spectroscopy. The folding topology retains both independent zinc binding modules (CCHC and CCCC). Each module consists of two orthogonally arranged antiparallel beta-sheets, and the carboxyl-terminal CCCC module is terminated by an alpha-helix. 15N magnetic relaxation data indicate that the modules differ in terms of conformational flexibility. They pack together via a hydrophobic core region. In addition, Arg122 in the CCHC module and Glu155 in the CCCC module are linked by an intermodular hydrogen bond and/or salt bridge. These residues are absolutely conserved in the CRP family of LIM proteins, and their interaction might contribute to the relative orientation of the two zinc-binding modules in CRP LIM2 domains. The global fold of quail CRP2 LIM2 is very similar to that of the carboxyl-terminal LIM domain of the related but functionally distinct CRP family member CRP1, analyzed recently. The carboxyl-terminal CCCC module is structurally related to the DNA-binding domain of the erythroid transcription factor GATA-1. In the two zinc-binding modules of quail CRP2 LIM2, flexible loop regions made up of conserved amino acid residues are located on the same side of the LIM2 domain and may cooperate in macromolecular recognition. 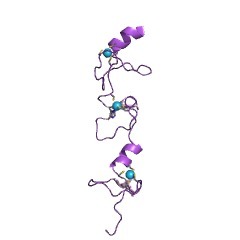 NMR structure of the 35-residue villin headpiece subdomain. The NMR structure of an autonomously folding subdomain from villin headpiece is reported. It forms a novel three helix structure with the actin-binding residues arrayed on the C-terminal helix. 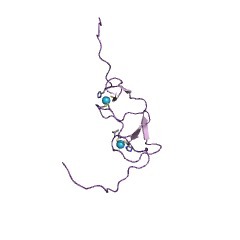 Molecular dissection of a LIM domain. LIM domains are novel sequence elements that are found in more than 60 gene products, many of which function as key regulators of developmental pathways. 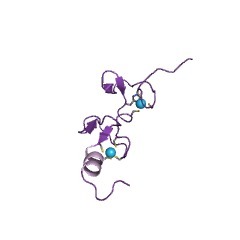 The LIM domain, characterized by the cysteine-rich consensus CX2CX16-23HX2CX2CX2CX16-21 CX2-3(C/H/ D), is a specific mental-binding structure that consists of two distinct zinc-binding subdomains. 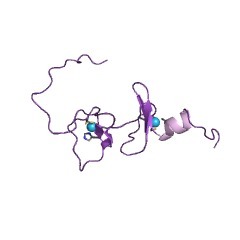 We and others have recently demonstrated that the LIM domain mediates protein-protein interactions. However, the sequences that define the protein-binding specificity of the LIM domain had not yet been identified. 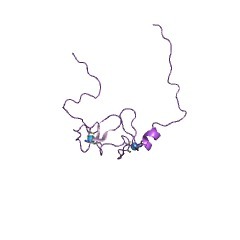 Because structural studies have revealed that the C-terminal zinc-binding module of a LIM domain displays a tertiary fold compatible with nucleic acid binding, it was of interest to determine whether the specific protein-binding activity of a LIM domain could be ascribed to one of its two zinc-binding subdomains. To address this question, we have analyzed the protein-binding capacity of a model LIM peptide, called zLIM1, that is derived from the cytoskeletal protein zyxin. 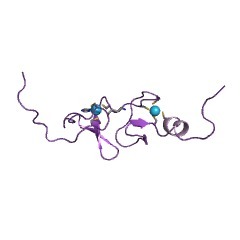 These studies demonstrate that the protein-binding function of zLIM1 can be mapped to sequences contained within its N-terminal zinc-binding module. 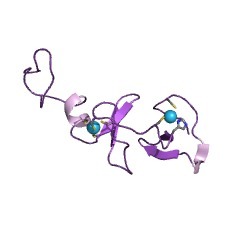 The C-terminal zinc-binding module of zLIM1 may thus remain accessible to additional interactive partners. 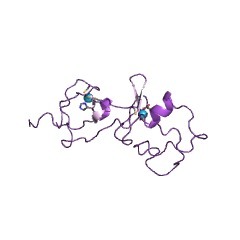 Our results raise the possibility that the two structural subdomains of a LIM domain are capable of performing distinct biochemical functions. 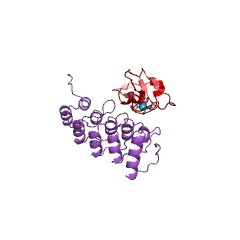 Interactions of the LIM-domain-binding factor Ldb1 with LIM homeodomain proteins. The LIM homeodomain (LIM-HD) proteins, which contain two tandem LIM domains followed by a homeodomain, are critical transcriptional regulators of embryonic development. 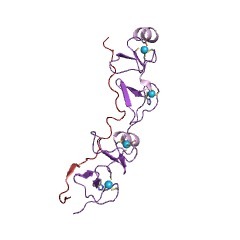 The LIM domain is a conserved cysteine-rich zinc-binding motif found in LIM-HD and LMO (rhombotin or Ttg) proteins, cytoskeletal components, LIM kinases and other proteins. LIM domains are protein-protein interaction motifs, can inhibit binding of LIM-HD proteins to DNA and can negatively regulate LIM-HD protein function. How LIM domains exert these regulatory effects is not known. 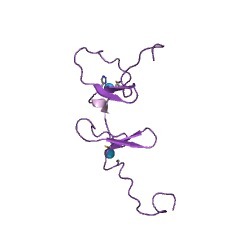 We have now isolated a new LIM-domain-binding factor, Ldb1, on the basis of its ability to interact with the LIM-HD protein Lhx1 (Lim1). High-affinity binding by Ldb1 requires paired LIM domains and is restricted to the related subgroup of LIM domains found in LIM-HD and LMO proteins. The highly conserved Xenopus Ldb protein XLdb1, interacts with Xlim-1, the Xenopus orthologue of Lhx1. When injected into Xenopus embryos, XLdb1 (or Ldb1) can synergize with Xlim-1 in the formation of partial secondary axes and in activation of the genes encoding goosecoid (gsc), chordin, NCAM and XCG7, demonstrating a functional as well as a physical interaction between the two proteins. 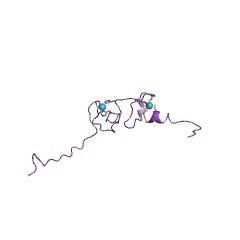 Solution structure of a naturally-occurring zinc-peptide complex demonstrates that the N-terminal zinc-binding module of the Lasp-1 LIM domain is an independent folding unit. The three-dimensional solution structure of the 1:1 complex between the synthetic peptide ZF-1 and zinc was determined by 1H NMR spectroscopy. 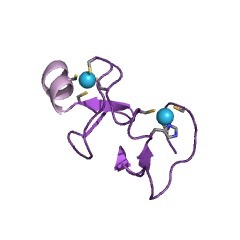 The peptide, initially isolated from pig intestines, is identical in sequence to the 30 N-terminal amino acid residues of the human protein Lasp-1 belonging to the LIM domain protein family. The final set of 20 energy-refined NMR conformers has an average rmsd relative to the mean structure of 0.55 A for the backbone atoms of residues 3-30. Calculations without zinc atom constraints unambiguously identified Cys 5, Cys 8, His 26, and Cys 29 as the zinc-coordinating residues. 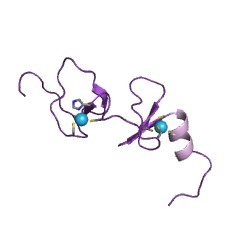 LIM domains consist of two sequential zinc-binding modules and the NMR structure of the ZF-1-zinc complex is the first example of a structure of an isolated module. 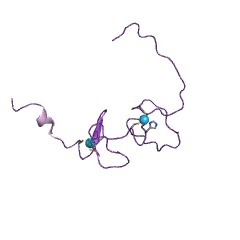 Comparison with the known structures of the N-terminal zinc-binding modules of both the second LIM domain of chicken CRP and rat CRIP with which ZF-1 shares 50% and 43% sequence identity, respectively, supports the notion that the zinc-binding modules of the LIM domain have a conserved structural motif and identifies local regions of structural diversity. The similarities include conserved zinc-coordinating residues, a rubredoxin knuckle involving Cys 5 and Cys 8, and the coordination of the zinc ion by histidine N delta in contrast to the more usual coordination by N epsilon observed for other zinc-finger domains. 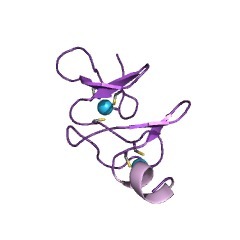 The present structure determination of the ZF-1-zinc complex establishes the N-terminal half of a LIM domain as an independent folding unit. The structural similarities of N- and C-terminal zinc-binding modules of the LIM domains, despite limited sequence identity, lead to the proposal of a single zinc-binding motif in LIM domains. The coordinates are available from the Brookhaven protein data bank, entry 1ZFO. 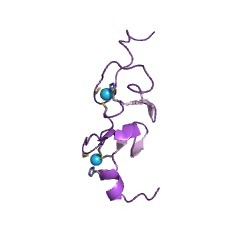 Structure of the cysteine-rich intestinal protein, CRIP. LIM domains are Zn-binding arrays found in a number of proteins involved in the control of cell differentiation, including several developmentally regulated transcription factors and a human proto-oncogene product. 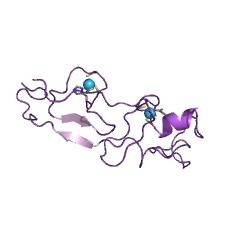 The rat cysteine-rich intestinal protein, CRIP, is a 76-residue polypeptide which contains a LIM motif. The solution structure of CRIP has been determined by homonuclear and 1H-15N heteronuclear correlated nuclear magnetic resonance spectroscopy. Structures with individual distance violations of < or = 0.03 angstrom and penalties (squared sum of distance violations) of < or = 0.06 angstrom2 were generated with a total of 500 nuclear Overhauser effect (NOE)-derived distance restraints (averaging 15.6 restraints per refined residue). Superposition of backbone heavy atoms of ordered residues relative to mean atom positions is achieved with pairwise rms deviations of 0.54(+/-0.14) angstrom. 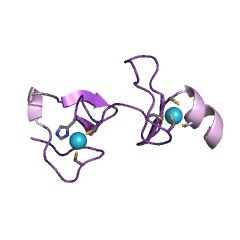 As observed previously for a peptide with the sequence of the C-terminal LIM domain from the avian cysteine-rich protein, CRP (cCRP-LIM2), CRIP binds two equivalents of zinc, forming N-terminal CCHC (Cys3, Cys6, His24, Cys27) and C-terminal CCCC (Cys30, Cys33, Cys51, Cys55) modules. The CCHC and CCCC modules in CRIP contain two orthogonally-arrayed antiparallel beta-sheets. 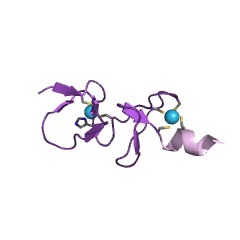 The C-terminal end of the CCHC module contains a tight turn and the C terminus of the CCCC module forms an alpha-helix. 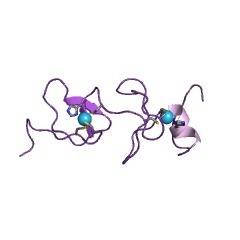 The modules pack via hydrophobic interactions, forming a compact structure that is similar to that observed for cCRP-LIM2. The most significant differences between the structures occur at the CCHC module-CCCC module interface, which results in a difference in the relative orientations of the modules, and at the C terminus where the alpha-helix appears to be packed more tightly against the preceding antiparallel beta-sheet. The greater abundance of NOE information obtained for CRIP relative to cCRP-LIM2, combined with the analysis of J-coupling and proton chemical shift data, have allowed a more detailed evaluation of the molecular level interactions that stabilize the fold of the LIM motif. Specificity of LIM domain interactions with receptor tyrosine kinases. 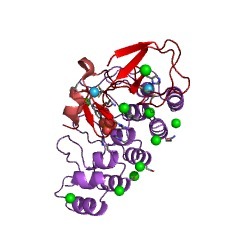 LIM domains, Cys-rich motifs containing approximately 50 amino acids found in a variety of proteins, are proposed to direct protein*protein interactions. To identify structural targets recognized by LIM domains, we have utilized random peptide library selection, the yeast two-hybrid system, and glutathione S-transferase fusions. 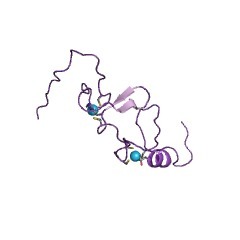 Enigma contains three LIM domains within its carboxyl terminus and LIM3 of Enigma specifically recognizes active but not mutant endocytic codes of the insulin receptor (InsR) (Wu, R. Y., and Gill, G. N. (1994) J. Biol. Chem. 269, 25085-25090). Interaction of two random peptide libraries with glutathione S-transferase-LIM3 of Enigma indicated specific binding to Gly-Pro-Hyd-Gly-Pro-Hyd-Tyr-Ala corresponding to the major endocytic code of InsR. Peptide competition demonstrated that both Pro and Tyr residues were required for specific interaction of InsR with Enigma. 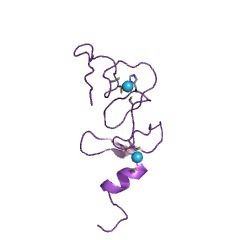 In contrast to LIM3 of Enigma binding to InsR, LIM2 of Enigma associated specifically with the receptor tyrosine kinase, Ret. Ret was specific for LIM2 of Enigma and did not bind other LIM domains tested. 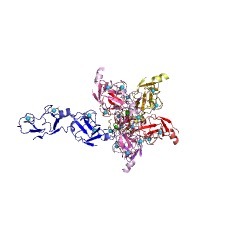 Mutational analysis indicated that the residues responsible for binding to Enigma were localized to the carboxyl-terminal 61 amino acids of Ret. A peptide corresponding to the carboxyl-terminal 20 amino acids of Ret dissociated Enigma and Ret complexes, while a mutant that changed Asn-Lys-Leu-Tyr in the peptide to Ala-Lys-Leu-Ala or a peptide corresponding to exon16 of InsR failed to disrupt the complexes, indicating the Asn-Lys-Leu-Tyr sequence of Ret is essential to the recognition motif for LIM2 of Enigma. We conclude that LIM domains of Enigma recognize tyrosine-containing motifs with specificity residing in both the LIM domains and in the target structures. 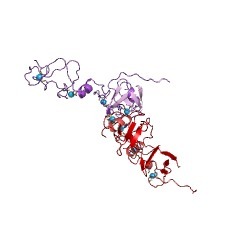 The LIM domain: a new structural motif found in zinc-finger-like proteins. 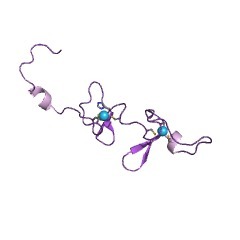 An important new family of proteins has recently been described that carries a novel cysteine-rich zinc-binding domain called the LIM domain. This protein family is present in mammals, amphibians, flies, worms and plants and its main function is in developmental regulation. 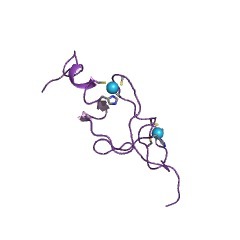 Although a role in protein-protein interaction seems likely, intriguing similarities to GATA zinc fingers imply that the LIM domain may also be involved in binding to specific nucleic acids. 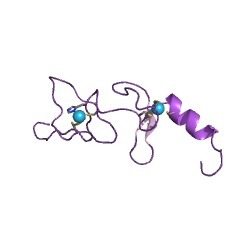 The LIM domain is a modular protein-binding interface. 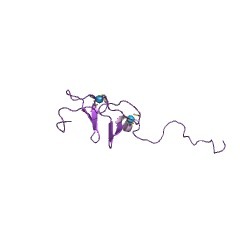 LIM domains are zinc-binding protein sequences that are found in a growing number of proteins, including certain transcriptional regulators, proto-oncogene products, and adhesion plaque constituents. Here we define the biological activity of the LIM domain through studies of an adhesion plaque protein called zyxin that displays three C-terminal LIM domains. 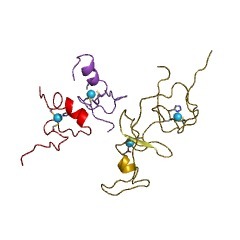 We have used our ability to reconstitute complexes between zyxin and its two known binding partners, alpha-actinin and the cysteine-rich protein (CRP), to examine the involvement of LIM domains in protein-protein interactions. We have determined that one of the three LIM domains of zyxin is necessary and sufficient to support the association of zyxin with CRP. 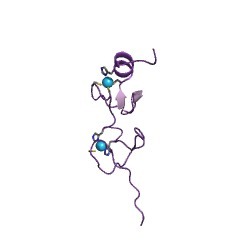 Our findings demonstrate that the LIM domain functions as a specific protein-binding interface. NMR structure of a specific DNA complex of Zn-containing DNA binding domain of GATA-1. The three-dimensional solution structure of a complex between the DNA binding domain of the chicken erythroid transcription factor GATA-1 and its cognate DNA site has been determined with multidimensional heteronuclear magnetic resonance spectroscopy. 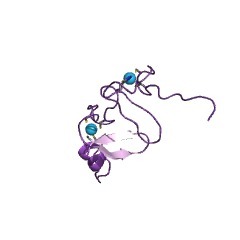 The DNA binding domain consists of a core which contains a zinc coordinated by four cysteines and a carboxyl-terminal tail. The core is composed of two irregular antiparallel beta sheets and an alpha helix, followed by a long loop that leads into the carboxyl-terminal tail. 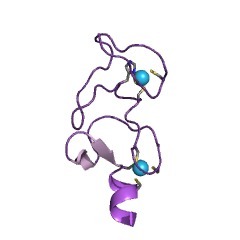 The amino-terminal part of the core, including the helix, is similar in structure, although not in sequence, to the amino-terminal zinc module of the glucocorticoid receptor DNA binding domain. In the other regions, the structures of these two DNA binding domains are entirely different. 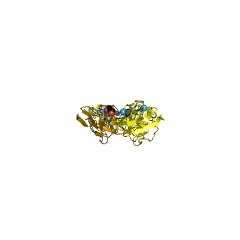 The DNA target site in contact with the protein spans eight base pairs. The helix and the loop connecting the two antiparallel beta sheets interact with the major groove of the DNA. The carboxyl-terminal tail, which is an essential determinant of specific binding, wraps around into the minor groove. The complex resembles a hand holding a rope with the palm and fingers representing the protein core and the thumb, the carboxyl-terminal tail. The specific interactions between GATA-1 and DNA in the major groove are mainly hydrophobic in nature, which accounts for the preponderance of thymines in the target site. A large number of interactions are observed with the phosphate backbone. Novel cysteine-rich motif and homeodomain in the product of the Caenorhabditis elegans cell lineage gene lin-11. The gene lin-11 is required for the asymmetric division of a vulval precursor cell type in the nematode Caenorhabditis elegans. Putative lin-11 complementary DNAs were sequenced and found to encode a protein that contains both a homeodomain and two tandem copies of a novel cysteine-rich motif: C-X2-C-X17-19-H-X2-C-X2-C-X2-C-X7-11-(C)-X8-C. Two tandem copies of this motif are also present amino-terminal to the homeodomains in the proteins encoded by the genes mec-3, which is required for C. elegans touch neuron differentiation, and isl-1, which encodes a rat insulin I gene enhancer-binding protein. 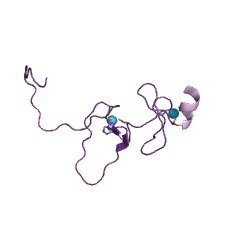 The arrangement of cysteine residues in this motif, referred to as LIM (for lin-11 isl-1 mec-3), suggests that this region is a metal-binding domain. 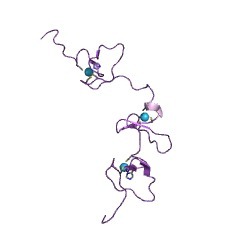 The presence in these three proteins of both a potential metal-binding domain and a homeodomain distinguishes them from previously characterized proteins. SwissProt sequences and OMIM curated human diseases associated with missense mutations within the LIM domain. This information is based on mapping of SMART genomic protein database to KEGG orthologous groups. Percentage points are related to the number of proteins with LIM domain which could be assigned to a KEGG orthologous group, and not all proteins containing LIM domain. Please note that proteins can be included in multiple pathways, ie. the numbers above will not always add up to 100%.